Mayor Jim Watson wants Ottawa to cap the 'glut' of payday loan outlets in Ottawa’s most vulnerable neighbourhoods. Mayor Jim Watson wants to place a cap on what he calls the "glut" of payday loan outlets crowding some of Ottawa's most vulnerable neighbourhoods. The city now has the ability to control where payday loan companies set up shop, thanks to new zoning powers bestowed at the start of 2018 by the provincial government. Watson wants to use those powers, particularly in areas like Montreal Road where there's already a concentration of the businesses. Ottawa has yet to draft a bylaw to exercise that power — but the mayor hopes to start that process soon. "I think when you have a glut of one type of business like this, it's not good for the economic well-being of the other businesses or the residential neighbourhood," Watson said. While the city can't force existing lenders to close, Watson said it can stop them from multiplying. Depending on how low the cap is set, the city could also stop new shops from replacing old ones when they close. Combined with rate changes imposed by the provincial government, Watson said new zoning rules could shrink the number of storefronts in the city. Provincial records show there are currently 50 licensed payday lenders in Ottawa, but the Causeway Work Centre has identified as many as 70 lenders — many of which are operating without a provincial license. They're generally concentrated in areas of the city where incomes are low, according to Doug Pawson, Causeway's director of social enterprise and social finance. 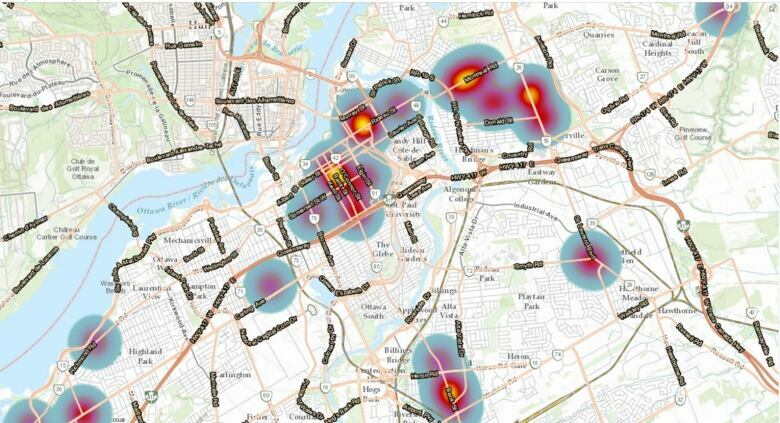 "[They] really can distress a neighbourhood financially," said Pawson, who has created a heat map of Ottawa's payday loan outlets. Rideau-Vanier Coun. Mathieu Fleury knows first-hand the impact large clusters of payday lenders can have on a community. There are 15 along Montreal Road in his ward, and another opened just last month. When they're grouped together, it becomes easy for people to take out high-interest loans from multiple places, driving them into deeper and deeper wells of debt, Fleury said. "You put people in very vulnerable situations and even more challenging financial situations," he said. In addition to a cap, Fleury said another way to keep the outlets from concentrating in a few neighbourhoods is to require lenders to remain a certain distance from each other. Still, Fleury said he also doesn't want to see the business driven underground — and that means the city will have to strike an uneasy balance with the lenders. One city that could serve as a blueprint for Ottawa is Hamilton, where only one payday loan storefront is allowed per ward. That city also requires payday lenders to pay a business license fee to the city, with the proceeds funding anti-poverty initiatives that treat the root cause of payday loan proliferation. "It's just another barrier that a municipality can implement to potentially squeeze out smaller payday lenders," said Pawson. First, however, councillors have to agree to the idea. Then city staff have to do to draft new bylaws and regulate the proximity between loan outfits. It's likely there won't be any changes until after Ottawa elects a new council in the spring.